Most fun Event of the year! I'm placing the Reorder for Ace Race packs - here's the list of what I have. Please let me know ASAP of any corrections. Ace Race had 4 players tied with 1 Ace and 2 Metals: Dwayne Fairchild, Robert Klier, Chris Behymer and Danny Umbarger - in a CTP Throw Off, Dwayne Fairchild wins it! Congratulations Dwayne. For those signing up for Ace Race now till day of, you will get one disc to use that day and the rest of the pack will be available at the shop within the next 7-10 days - I'll have to order them Monday or Tuesday of next week. Everyone who signs up will get the complete pack, just after today will only get one disc on Saturday, day of event. Any questions let me know. 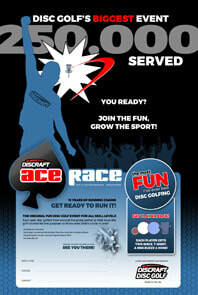 ​Tell your friends - if you can't attend the Ace Race you can still get the pack. What a deal! $30 for $68 worth of swag! NOTE: All entires after 10/4/17 will get a voucher to send in to Discraft to get the size shirt they want. I had to order the packs that day. We'll be getting 110 packs so keep the entries coming. Fair Draw Doubles – try to match less experienced players with more experienced players. We will be having a Mixed Doubles format again this year. We know there are a lot of women who want to play but would prefer to play with their spouse, significant other, so here you go. Make sure you let us know with a note at registration. Note: Registration after 10/17/17 for Day-Glo tournament is $35.